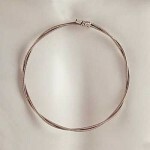 Paul Rodgers Guitar String Pendant made out of Paul’s used/played gold colored string. Designed by 2x breast cancer survivor Elisa Guida, pendant is app. 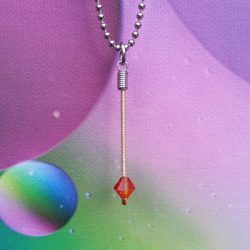 1 6/8″ in length and contains a 6mm Fire Opal Swarovski crystal. Comes with a 16, 18, 20, 22 or 24″ beaded stainless steel chain. This piece is made to order and takes approximately 4-5 weeks to complete. These pieces are hand made and vary slightly. If you would like a different colored crystal email: elisa@stringsforacure.org for crystal options.